This type of trap is probably the trap you are most familiar as it has been the trap of choice in the world of Hollywood, and it is stereotypically baited with cheese. 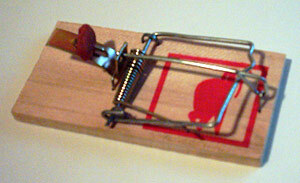 If you purchase this type of trap, do not bait it with cheese as most mice don’t like cheese. Mice prefer such foods as oats, chocolate, meat, or peanut butter when baiting this type of trap. The way it works is that a mouse trips a spring loaded trigger and the bar snaps down on the mouses neck which usually results in killing mice. If you’ve been talking to friends and family, you may have noticed a new type of trap that uses an electrical charge to shock the mouse to death. This trap is tripped when a mouse completes the circuit by contacting two electrodes. The way to go if you’re looking for a trap in this class is the Victor Electronic Mouse Trap. It is safe to use around pets and children and has a shutdown mechanism to prevent accidental shock if the top of the box is open. This device also meets the international humane kill standards in order to kill mice. Another great mouse trap that has excellent reviews on Amazon is the Repeater Multi-Catch. If you have more than one mouse this is undoubtedly the way to go. This is another way of getting rid of mice, though it is regarded as inhumane. The way this mouse trap works is that an adhesive is spread across a piece of cardboard or similar and have a bait in the middle (some glues are scented to attract mice). It sounds like a good idea because the mouse doesn’t die instantly, but what usually happens is that the mouse will die of exposure or dehydration. Sometimes mice are known to chew through their own limbs to try and escape. While it is an effective means for getting rid of a mouse, there are more humane ways of killing mice. If you like the idea of this method anyways, try this glue trap from Victor Pest Control.